The idea of discipline has been talked about ad nauseam lately. The idea being when there is something you don’t want to do, and you do it anyway. I like the idea in my personal space as I understand there will not always be motivation to work out, or motivation to get up early to work on my personal dreams, or motivation to do certain positive things, but I should do them anyway. The self-help industry is filled with people telling us now that if we want to make lasting improvements or changes that we shouldn’t really think about it…we need to just do it. Action is more powerful than anything else. If you don’t feel like lifeguarding or going to work…do it anyway. That is discipline. Recently, I was doing some research and ran across John Maxwell speaking about the idea of discipline. John Maxwell is a best selling author and speaker on leadership and he was talking about how he gets up every morning at 5am to write. He continued to say that he doesn’t use discipline to get him up, but he uses anticipation. He thinks about the positive impact his writing will have on people all over the world, and that is what gets him out of bed. He continued by explaining the cycle he sees of “fruits” of his work and the “anticipation” of more “fruits” create an upward spiral for him and is so much more powerful than just doing something he didn’t want to do out of discipline. I thought about this fresh concept immediately related to lifeguards. I think lifeguarding can sometimes be a dreaded task. It can be overwhelming, or underwhelming, it can be thankless, and it can be exhausting and demanding. It can be a chore. It can be something that they don’t want to do. If, as an Aquatics Leader I took the approach of discipline. I could approach my staff with the mentality and feedback of you may not feel like lifeguarding, but we do it anyway. We know it has positive impact, and even though we don’t feel like it, we do it anyway. This is discipline. We show up because people are depending on us and we said we would. We show up and lifeguard even if there is something more exciting going on. We show up and lifeguard even though we know it is boring or exhausting. We do it anyway. But maybe that isn’t enough. Maybe if we approached lifeguarding and integrated the “anticipation & fruit” concept into our leadership we would be more successful. What if lifeguards anticipated something was going to happen every day? What if lifeguards were able to see the fruit of their work? What if lifeguards anticipated coming to work because of something positive occurring? What if lifeguards anticipated lifeguarding because they knew they were going to save someone? What if lifeguards anticipated showing up because they knew a positive experience or feeling was going to happen? What if a lifeguard woke up and thought about how they were looking forward to seeing what positive feedback they were going to receive or how the leader would compliment their rescue in front of the team? What if a lifeguard fell asleep thinking about their audit and how well their team worked together or a crazy scenario they were able to solve? 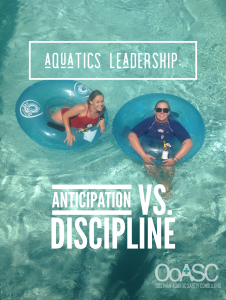 What if my job as a leader was to create anticipation in my lifeguards, not discipline. Now I know discipline is a positive trait for many areas of our lives, so I am not saying it isn’t valuable, don’t misunderstand me. I am thinking about how different a leadership approach would be if my focus was on anticipation to get the same task of lifeguarding done. I immediately thought back to 2002ish, when I was managing a waterpark. Every morning we had a crew set-up meeting where we would go over the activities for the day, review safety information, stretch and have a team building activity or skill review and then all employees were released to their areas and stand locations. Everyday a group of wave pool guards would book it out of crew set-up and head to the wave pool and they would run a competition style scenario. My rule was they could do this as long as they were all on stand so each area could be cleared 5 minutes prior to gates opening. They loved this time. They would ask about the prior day’s scenario if they were off, they would tell me at crew set-up how they had a dream about a fun scenario the night before, the head guards would ask me for feedback on an idea for running a scenario, they would talk about it in the break room all day, they truly anticipated what would happen at work that day or the next. 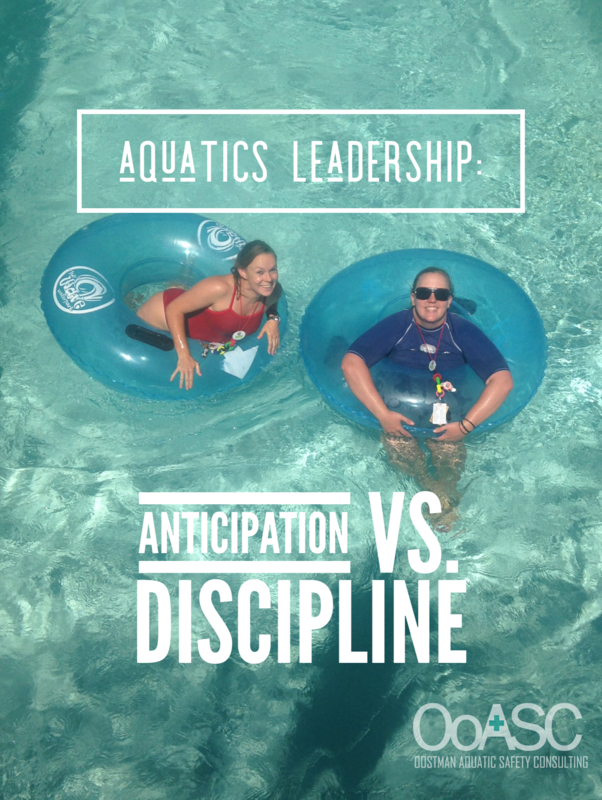 The anticipation created a magical culture where it was more than just discipline driving people to work everyday, and as lifeguards and leaders of lifeguards I think we need more of that. So, how do we increase anticipation? I bet a lot of you do this without even thinking about it! What would you add? How do you increase or create anticipation?